Chris Hull celebrates with team-mates at St Colman's Park. 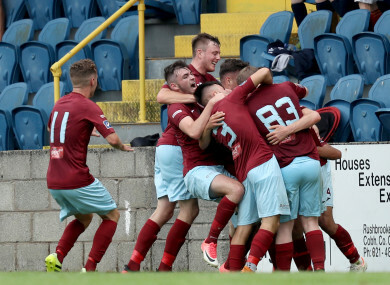 COBH RAMBLERS ENJOYED one of the greatest day’s in the club’s 96 year history on Monday evening, with the Cork side snatching a dramatic 1-0 victory against Dundalk to book their place in the EA Sports Cup final. Stephen Henderson’s young side, who’s average attendances at St Colman’s Park this season have been between just 100 and 300 spectators, executed a stunning upset thanks to Chris Hull’s goal with 15 minutes remaining. Dundalk won the League Cup last season, their eighth trophy in four seasons, but suffered a second defeat in the space of a week after a humiliating exit from Europe at the hands of AEK Larnaca on Thursday. Ramblers have never before made it to a League or FAI Cup final, with Monday’s semi-final their first appearance in the final four of either competition since 1983. The club currently sit sixth in the First Division, 14 places below Monday’s opponents in the SSE Airtrcity League pyramid. They will now face Derry City in the showpiece, with Kenny Shiels’ Candystripes defeating Sligo 1-0 at the Showgrounds thanks to Rory Hale’s first-half strike. Email “Shock giant-killing as Cobh Ramblers stun League Cup holders Dundalk to book final spot”. Feedback on “Shock giant-killing as Cobh Ramblers stun League Cup holders Dundalk to book final spot”.